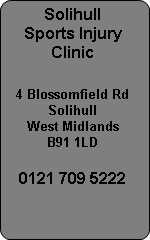 Solihull Sports Injury Clinic diagnose and treat dancing injuries. Ballroom dancing, ballet, modern street dance, Irish dancing and commercial show dancers all visit the Atlas Sports Injury Clinic in Solihull West Midlands. Clinic Director John Williams and his team treat the dancers and models at the Birmingham Clothes Show Live every year at the NEC and is part of the back stage team. Irish dancing can be very demanding on the legs and low back and Atlas have the expertise to deal with these problems too. Sports Massage is an important part of keeping a dancer fit and should be used along with stretching to retain flexibility and muscle tone. Our Sports Massage Therapist Justine Corey has years of experience touring with Michael Flatley and his Lord of the Dance show. Justine had to treat the cast of dancers from the show during their 6 years tour of Asia. Irish dancers have a punishing routine which is hard on feet, ankles and knees and injuries often occur. Ballroom Dancing and Latin can involve many hours of practice when preparing for competitions and we work closely with dance teachers and competitors such as Andrew Escolme and Amy Louise-Baker who are 2 of England's top Latin competition dancers. Stretching is often overlooked by many athletes and even when done, its often not carried out correctly. Many courses and books conform to the standard maintenance stretch of 10-15 seconds with a developmental stretch of 30 seconds. While a maintenance stretch will return a worked muscle back to its pre-exercise length in 10 seconds a shortened muscle will not lengthen in 30 seconds. For this to happen the stretch needs to be performed in a specific way, progressively over a longer period of time. At Atlas we show you how to get the best out of stretching techniques which can improve your flexibility and reduce injuries.